• Four years Bachelor of Technology (B.Tech.) degree program in Chemical Engineering. • Two years Master of Technology (M.Tech.) degree program in Chemical Engineering. Besides the Doctor of Philosophy (Ph.D.) degree programs in Chemistry and Chemical Engineering, the department also participates in the two years Master of Technology degree program in Environmental Engineering offered by the department of Civil Engineering. About 220 students are currently enrolled in various programs in the department. The department has well-qualified and experienced faculty to conduct the teaching & research activities in the department. (a) Preparation of the student for the technical and analytical skills that he/she will require as a professional engineer. (b) To equip the student with an adequate background of Humanities and Social Sciences that will be necessary to enable them to play an effective role as an engineer for the benefit of the society. Chemical Engineering is a very versatile and exciting field of study. The Chemical Engineers in Action website shows the various activities that chemical engineers can do. The job profiles held by chemical engineers range from entrepreunership to running multinational organizations. 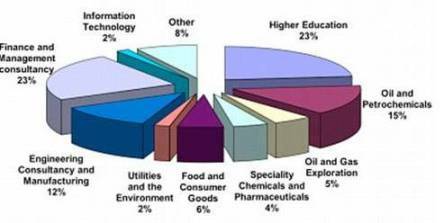 The pie-chart on left (from the University of Cambridge website) gives an idea of the various exciting career opportunities available to chemical engineers.